Blessed with a baby below about six months? Tensed about maintaining your lifestyle with your adorable one? The Chicco has come with an outstanding jogging stroller for you then. It is famous for innovative convenience for the parents like you. Chicco TRE Performance Jogging Stroller is popular as a performance jogger. My Chicco TRE Performance Jogging Stroller Review is a result of thorough research on this outstanding product. After studying on it, I have found some incredible characteristics of this product which must attract you. We will discuss almost all of them step by step in my little effort; Chicco TRE Performance Jogging Strolle﻿﻿r Review. Hopefully, it has seldom characteristics which may be disliked by you. It's water resistant fabrics with several attractive colors will provide you durability with an attractive appearance. I think after analyzing my Chicco TRE Performance Jogging Stroller Review, you will gather several positive outlooks to have it. I think the Chicco TRE Performance Jogging Stroller is mostly preferred for its adjustable suspension. For that, it can provide an incredible run ability. Its adjustable handlebar makes the strolling easier. For the adjustable tracking feature, it may not be perfect for the serious joggers. But for the routine who want to maintain a smart lifestyle, it will be perfectly suitable. For the price tag of this product, some may want to refuse it but you may consider it as the best ‘everyday stroller’ for sustainable use. How Parent-Friendly Chicco TRE Performance Jogging Stroller Is﻿? A baby stroller mainly ensures the baby’s safety and comfort. But it is also important for the parents because it reduces the stretches of baby carrying. So, it is crucial before buying a stroller to consider how parent-friendly a stroller is. Parents consider a stroller good when it ensures their kids’ comfort and safety. I think Chicco’s plastic seat should be more upgraded to make sure that. But most importantly, it is very easy to set up and operate. For the foot brake, you will be able to control it quickly. Another attractive feature is its massive Storage bin. You may not find such a big storage bin like this in a jogging stroller easily. So you can keep the diapers, baby clothes, snacks easily in it. The cup holders are quite shallow, so you have to keep small bottles. If they were big, it would be better. As I told before, it is very easy to operate with a one hand fold that auto locks and self-stands. It seems very helpful towards the parents while strolling. Its folding and unfolding features are also easier than most other strollers. Overall, it seems to me very friendly to the parents. Is Chicco TRE’s adjustable suspension really ﻿﻿helpful﻿﻿? My personal experience and others compliments indicate that Chicco TRE’s adjustable suspension is really useful. When jogging the stroller did seem stable, but it wandered significantly when it was strolled over the beaten path where flexible tracking is needed. Sometimes for additional pressure, the handlebar veers to one side to another. Otherwise, it is all okay. During the most other times, Chicco TRE’s adjustable suspension will seem to you helpful. 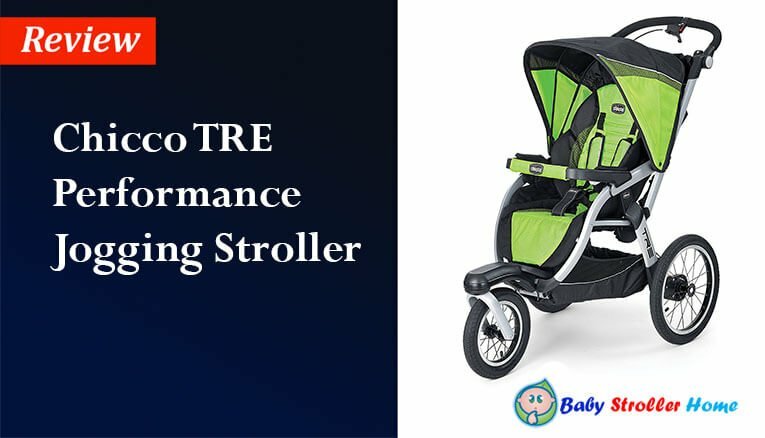 The price tag of Chicco TRE Performance Jogging Stroller is quite uncomfortable for many budget buyers. 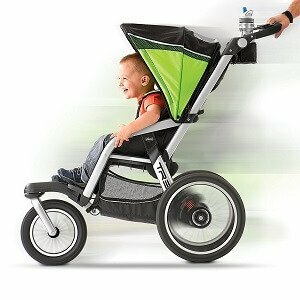 If your goal is a serious running stroller, I will not suggest you to purchase this product. But as an everyday stroller, it is the best for the city dwellers and a perfect routine life. My Chicco TRE Performance Jogging Stroller review has found out some limitations of this product such as bulky figure, required large room, etc. But it also has discovered so many incredible features of it. Some of them are so unique that you must like it. So, think before you buy it. 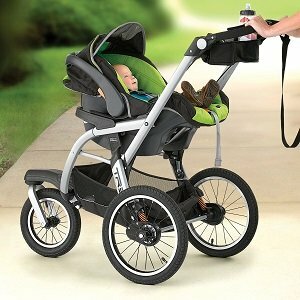 Despite having some limitations, I would like to recommend this product to those parents who want to have a stroller mainly for their daily jogging with their babies. At the same time, you may use it during your other daily activities. The maneuverability and run ability of it are also okay and it seems very parent-friendly to the most other parents. So the folks who love jogging with their adorable one with a parent-friendly jogging stroller must have it. Chris Campbell is a family counselor, author, and internationally acclaimed parenting expert who empowers families by sharing his principles, rules, and tools for raising happy and healthy kids. Parents can count on help from Chris whether they are simply looking for a bite-size tip to see them through a meltdown or delve further to transform their family life. His style is fast, witty, warm and encouraging. Chris delivers his deep insights in ways that today’s busy parents can easily understand and apply immediately. As Canada’s leading parenting expert, Chris promotes a firm but friendly “democratic parenting” style and offers practical solutions backed by extensive research. His own experience with raising two children using this parenting technique was so eye-opening and effective; he felt compelled to share his knowledge. His work aims to make life better for all kids through useful child guidance. Armed with years of research, clinical and field experience, Chris can provide a new, positive understanding of your current family dynamic with actionable solutions that will give you the hope and confidence needed to transform your family. On TV – Chris is the resident parenting expert on The Marilyn Denis Show and CTV News Channel. He hosted six seasons of The Parenting Show and has appeared on Canada AM, The Agenda with Steve Paikin, Steven and Chris, Breakfast Television, Global’s The Morning Show, Montel Williams and more. In Print – Chris has been interviewed by publications such as Cosmopolitan, Real Simple, Parent Magazine, Reader’s Digest, Canadian Family, Oh Baby, Canadian Living, Toronto Star, Globe & Mail, Metro News and more. He was also an “Ask an Expert” Columnist for Today’s Parent magazine. Online – Besides being the resident expert for AOL’s Parentdish.ca, Canada’s go-to portal for parenting info, Chris has also appeared as a guest blogger on PTPA.com, Mabel’s Labels, Yummymummyclub.ca, ParentingPink.com, HitchedMag.com, DrLaura.com, Wellness.com, HealthyWealthyWIse.com, EverydayHealth.com, Sharecare.com, Parentingbookmark.com, Pregnancy.org and more. International Speaker – Chris is a highly sought-after speaker who presents at conferences and corporate events around the globe. He recently spoke at the inaugural TEDxKids in Brussels, Belgium. Consultant – Chris sits on the Health Advisory Board for Chatelaine magazine and is the parenting expert for The Bank of Montreal’s SmartSteps for Parents program. He has been the spokesperson for a variety of PR campaigns and was a contributing editor to the Ministry of Education grade 11 textbook on Family Studies. He conducted staff training at U of T’s renowned Institute of Child Studies Laboratory, North Toronto Early Years Learning Centre, and Foundations Private School, and was a regular speaker to staff and parent for chain of 30 child care centers in York Region. Chris was also the Canadian Co-Chair of Family Education for the North American Society of Adlerian Psychology (NASAP). Education – B.Sc., M.A. Counselling; OACCPP (Masters of Arts – Counseling from the Adler School of Chicago, and an Honours Bachelor of Science from the University of Waterloo) Family Counsellor – Private Practice – Chris is currently seeing clients in person and via Skype. Please visit the Counselling page for more information or to request an appointment online. Family – A lover of books, art, music, food, travel and the great outdoors, Chris lives in Toronto and has two young adult daughters who are finishing their university studies in the social sciences . . . just like their mom.